In Donbass, Ukraine is experiencing a catastrophe comparable with the 1986 Chernobyl nuclear disaster. Now as then, it is urgent to restore the confidence of the affected people in the state and their trust in each other, argues Sergii Parashyn. Sergii Parashyn is a board member of the Ukrainian Foundation for Democracy “People First” and former director of the Chernobyl Nuclear Power Plant. On 26 April, we commemorated another anniversary of the Chernobyl Nuclear Power Plant accident, which caused irreparable damage to the ecology of Ukraine, entailed large-scale destruction of infrastructure, colossal economic losses and evacuation of inhabitants from vast areas. But, perhaps, the most negative consequence of the disaster was the infliction of a severe psychological trauma to the population. People were disoriented, felt insecurity about the future, they were afraid for their children and distrustful of the government. Today, 32 years after the nuclear disaster, due to hostilities in Donbass and the loss of control over part of its territory, Ukraine is again experiencing a catastrophe, in the humanitarian dimension, comparable in scale to Chernobyl. There are about 3.8 million people in the temporarily occupied territories, about 0.5 million people live in the so-called “grey zone”. Even in the big cities of the Separate districts of Donetsk and Lugansk regions (SDDLR), there is an atmosphere of anxiety and despondency. It is not by chance that the Ferris wheel in the empty “1st of May” Entertainment Park in Lugansk reminded one well-known blogger of the Ferris wheel in Pripyat. 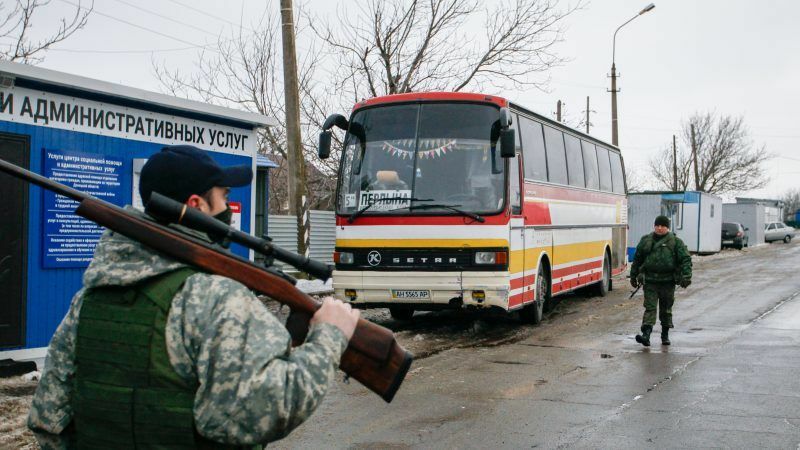 The psychological trauma suffered by residents of areas beyond Kyiv’s control as a result of military operations is further aggravated by resentment from the lack of care from the Ukrainian state, from the sense of humiliation and rejection that arises each time they have to pass control at the border crossing points, when they receive a pension or take children to a school located a few kilometres from the place of residence in the territory controlled by the Ukrainian military, etc. Unfortunately, we have to acknowledge that today there is no effective state policy for ensuring the loyalty to the Ukrainian state of people living in temporarily occupied territories and in the “grey zone”. shopping and service centres, etc. The realities are that the Ukrainian government is neither financially nor organizationally able to develop and implement a project to create such an infrastructure independently. It should be reminded that the international effort to overcome the consequences of the Chernobyl disaster with the decisive participation of international partners of Ukraine (G-7, EU, UN) was successful and that it could be reproduced in Donbass. This concerns both the content part (the formation of a comfortable humanitarian, social, information, service, etc. space, by creating an appropriate high-quality infrastructure with the involvement of Western specialists) and the institutional part (eliminating corruption risks and ensuring the reliability and sustainability of funding through the creation of a special Financial Fund for the project, controlled by the donor assembly). Speaking about the need for Western and especially European support for the project, we proceed from the fact that the reason for the rebellion in Donbass was the course proclaimed by the Revolution of Dignity to deepen integration with the EU (through the signature of the Association Agreement), about which local residents, irradiated by Russian propaganda, had a highly distorted view. We assume that the implementation of a set of measures to overcome the consequences of a humanitarian catastrophe in the East of Ukraine, based on European values (respect for human dignity, freedom, solidarity, equality) and financially supported by the European Union, will contribute to the loyalty of the population of Donbass to Europe, the European choice of Ukraine and to the Ukrainian state. This will soon create favourable prerequisites for a future dialogue on the re-integration of the population of Donbass into Ukrainian society and the establishment of sustainable peace in the region. We believe that the EU may be interested in such project in terms of its importance for the European security. Judge for yourselves: the invasion of the Russian occupation forces in Donbas (as well as in Crimea), the permanent terror along the line of contact are, from the point of view of Russia, the punishment of Ukraine for its desire to get closer to Europe. Similar, in fact, is the intimidation of countries that are inclined to political and economic rapprochement with the EU, including those covered by the Eastern Partnership policy (Moldova, Belarus, Georgia, Armenia, Azerbaijan). This, in turn, contradicts the interests of the EU, aimed at creating a belt of stability, democracy and security along the perimeter of its borders. By supporting Ukraine in the restoration of confidence in Donbass, the European Union will also be able to demonstrate that it is ready to help its partners, using soft power, economic and political levers.